The Far Southeast Valley watershed comprises an area of approximately 10 square miles. It is subject to flooding and local drainage problems due to lack of planning and drainage infrastructure. 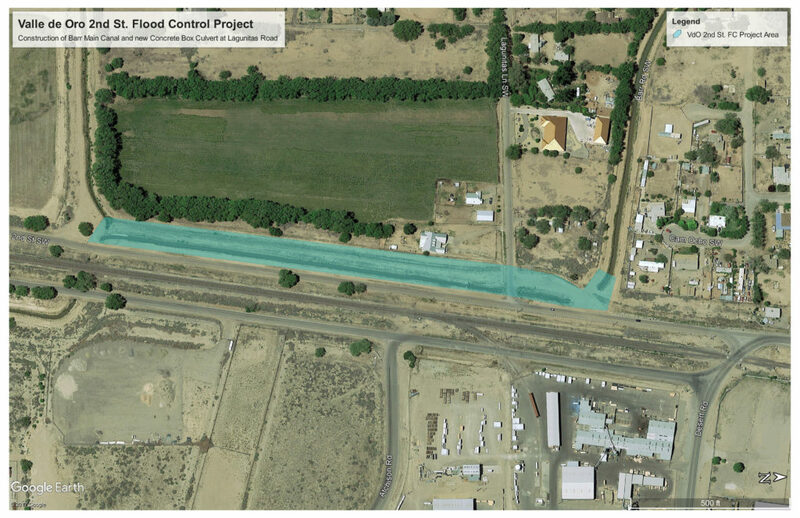 The SE Valley Drainage Master Plan identified channels, storm drains and detention ponds needed to convey water to MRGCD facilities and to the Rio Grande Bosque. The current project is one of the first facilities to convey that water to the Bosque. This project provides for the construction of channel lining for approximately 1,500 linear feet of the Barr Main Canal, 800 linear feet of reinforced concrete pipe for the upper end of the Barr Main Canal, and a 2-10’x8’ concrete box culvert at the Lagunitas Road crossing. This project is was completed in March 2018.